Discover cheap holiday packages to Wellington from Auckland, Christchurch, Queenstown and more. From its world-famous coffee scene to its natural beauty; Wellington is a food haven and full of interesting museums. It offers something for every kind of traveller. Trying to find the perfect holiday package deal? Browse Webjet's exclusive holiday deals and find the best flight + hotel for you. All our holiday package deals include flights to Wellington and hotel stays for the duration of your trip. Start your search today and build your ideal Wellington holiday package. Considered the "coolest little capital" in the world, Wellington has plenty to offer both local and international travellers. From its booming restaurant scene to its remarkable museum experiences and nearby natural scenery, there's something for everyone. But the biggest drawcard for Kiwi locals is the price. Flights start from NZD 34 and journey time from other main cities is less than an hour. The city is also home to the country's thriving movie industry. It's world-famous Weta Workshop is a must for film buffs, and the BATS Theatre is where many famous Kiwi actors began their careers. And of course there is the Lord of the Rings association; die-hard fans will recognise many of the filming locations, and there are more than enough LOTR tours to help you learn even more about these popular films. Every winter the city hosts one of New Zealand's biggest foodie events - The Wellington On A Plate Festival. It showcases the best of local gastronomy and is the perfect excuse to travel to the capital. Besides that, there's more delicious food to be found on Cuba street. It's home to some of the country's best brunch and alfresco spots. Wellington is also a kid-friendly destination. One of its best family attractions is Zealandia. The world's first urban ecosanctuary is accessible via the free shuttle. It departs every hour from 9:30 a.m. and is a fantastic way to teach kids about the importance of conservation. 1. Weather: The best time to visit New Zealand's capital city is between March and May. This shoulder season is still warm, but the crowds are thin. If you want to save money and don't mind strong winds, plan your trip during winter for low season. 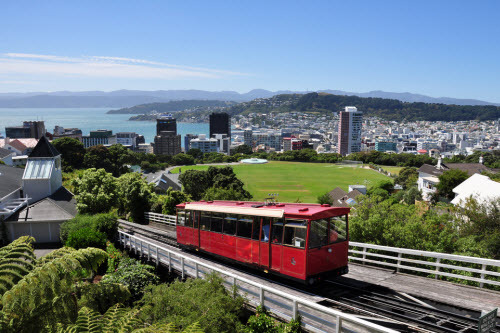 December to February is Wellington's busiest time of year thanks to warm weather and the school holidays. 2. Getting Around: Wellington is one of the most walkable cities in the world. All of its main attractions are close together so you won't need to hire a car to see the main sights. 3. Wi-Fi: Need to get online? Head to one of the city's many cafes. The connections are fast, and you'll be able to catch up on your emails or download a map while enjoying a delicious cup of coffee. 4. Airport: Wellington International Airport is 15-minutes away from the city. Taxi ranks are located outside the baggage claim area, or you can take the Airport Flyer Express bus into the CBD. 5. Dress in Layers: Wellington is known to have diverse weather conditions, all seasons in the same day. Keep a raincoat in your bag and wear layers that you can take off as the day heats up and put back on when the temperature starts to dip.